Hair Purifying Shampoo is designed for extremely swift yet elegant removal of all toxin residues. Within 10 minutes, you will be in the “Clean Zone” for up to 8 hours. It is safe for the scalp and all hair types. It does not effect color or specific gravity. Works as a “body wash” for body hair in addition to scalp. Drug testing via hair follicle sample has grown into a very popular method to detect drug use without invading ones so-called privacy compared to a urinalysis or a blood test. PLEASE NOTE: If you are using this shampoo on either cocaine or amphetamines, you MUST supplement this shampoo with the Nexxus Aloe Rid Pre-Conditioning shampoo. Use the Nexxus daily prior to using the Zydot on the day of the test. Internal Hair Purifying Treatment Removes Medications, Chemical Buildup and Other Impurities From Within the Hair Shaft. The only complete deep cleaning shampoo with purifying treatments and conditioner. Shampoo away external barriers such as hair spray, styling and finishing products, and everyday buildup to expose the inner hair. Purify by penetrating the hairshaft’s inner structure to release, dissolve, and remove the chemicals and medications bonded within the hair. Leave your hair pure and clean, free of all unwanted contaminants and impurities. Condition hair to control tangles, add sheen, and improve manageability. 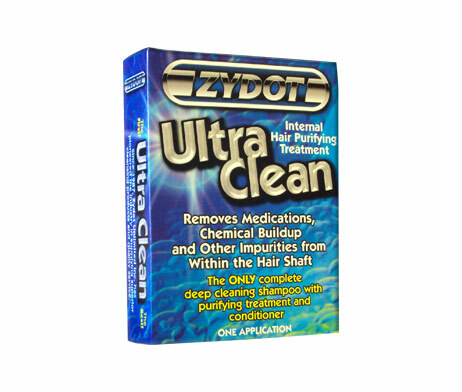 Zydot Ultra Clean Shampoo and Purifier contains Aloe Vera to help condition both the hair and scalp while the penetrating cleansing agents remove impurities. The Aloe based conditioner will leave your hair tangle free and full of body. To be used on the day you wish your hair to be clean and free of unwanted impurities.